Figure 3: Gap between emissions estimates and targets in 2014 and between projected emissions (with existing measures) and targets in 2020 in the non-ETS sectors. Negative and positive values respectively indicate overdelivery and shortfall. According to most recent estimates, in 2014 total EU greenhouse gas (GHG) emissions covered by the 2020 Climate and Energy Package were 23 % below the 1990 level and decreased by 4 % compared to 2013. According to the projections with existing measures provided by Member States in 2015, emissions are estimated to be 24 % lower in 2020 than they were in 1990. These projections were made before the 2014 emissions figures became available. The EU is therefore currently on track towards meeting its Europe 2020 greenhouse gas reduction target as well as its Kyoto Protocol targets. Source: European Commission and European Environment Agency (EEA). 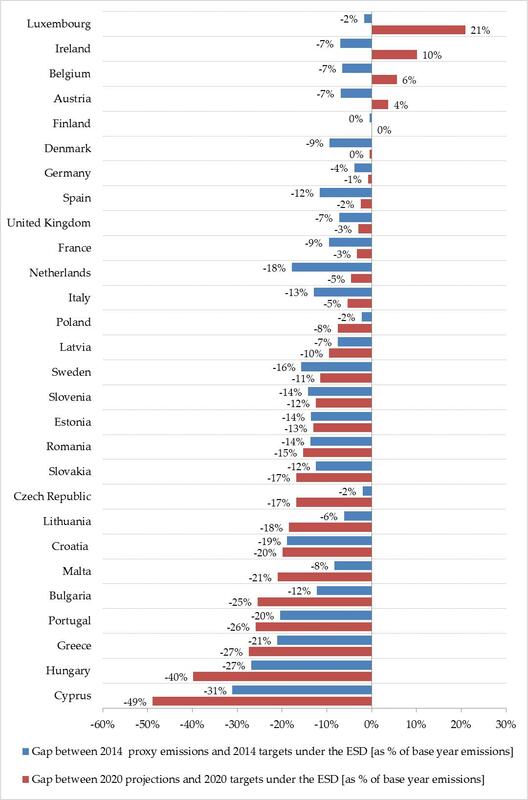 For all but four Member States (Luxembourg, Ireland, Belgium and Austria), projected emissions in 2020 are below the domestic targets set under the Effort Sharing Decision. According to the projections with existing measures provided by Member States, total EU GHG emissions in 2030 are estimated to be 27 % below 1990 levels. Additional measures are needed for the EU to meet the target of a domestic reduction in greenhouse gas emissions of at least 40 % by 2030 compared to 1990. To address this, the Commission has proposed a revision of the EU Emissions Trading System (EU ETS) in July 2015. In the first half of 2016, the Commission will also make proposals on the implementation of the non-ETS emissions reduction target of 30% compared to 2005. The EU continues to successfully decouple its economic growth from its GHG emissions. During the 1990-2014 period, the EU’s combined GDP grew by 46 %, while total GHG emissions (excluding LULUCF and including international aviation) decreased by 23 %. 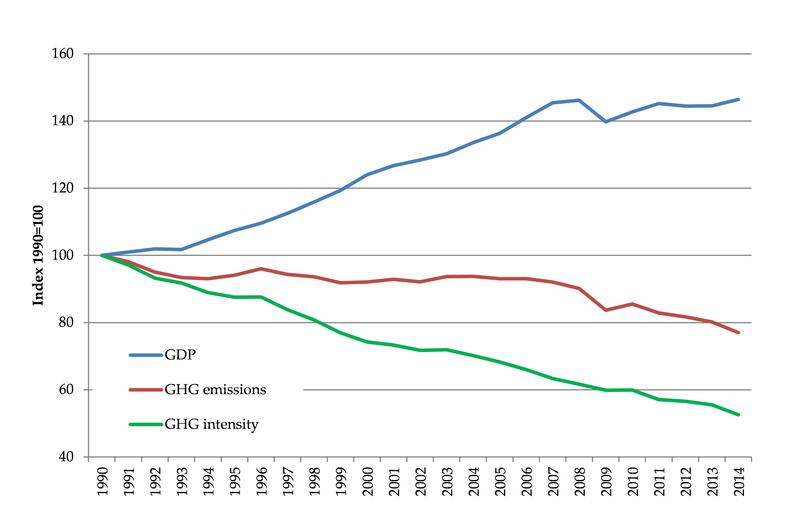 The EU’s GHG emission intensity, of the economy defined as the ratio between emissions and GDP, decreased by almost half between 1990 and 2014. The implementation of structural policies in the field of climate and energy has significantly contributed to this successful decoupling. In particular, the implementation of the 2020 Climate and Energy Package has resulted in a significant increase in renewable energy and progress in energy efficiency. Both of these are the key drivers behind the observed reduction in emissions, with the carbon price acting as driving force expected to be progressively stronger in the future. This report and its two annexes constitute the reports as required under Article 21 of Regulation (EU) No 525/2013 on a mechanism for monitoring and reporting greenhouse gas emissions and for reporting other information at national and Union level relevant to climate change, under Article 10(5) and Article 21(2) of the Directive 2003/87/EC establishing a scheme for greenhouse gas emissions allowance trading within the Community and under Article 38 of Directive 2009/31/EC on the geological storage of carbon dioxide. The accompanying staff working document includes additional technical information and data related to progress towards the Kyoto and EU 2020 objectives. It also provides the references for the main data and figures presented in this report. The Climate and Energy Package sets the EU a target of reducing GHG emissions by 20 % by 2020 compared to 1990, which is a 14 % decrease compared to 2005. This effort is in two parts: the sectors covered by the EU Emissions Trading System (ETS) and sectors under the Effort Sharing Decision (ESD). While the EU ETS provides an EU-wide cap, the ESD sets annual emissions allocations for non-ETS sectors in each Member State. According to Member States' projections with existing measures, the EU is expected to meet its 2020 target, as total emissions (including ETS and non-ETS) are expected to be 24 % lower in 2020 compared to 1990 levels. 24 Member States are projected to reach their 2020 targets in the non-ETS sectors through existing policies and measures. However, four Member States — Luxembourg, Ireland, Belgium and Austria — will need to either put in place additional measures to meet their 2020 targets for non-ETS sectors or make use of the flexible mechanisms provided for in the ESD. This includes transfers of unused emissions allocations from one year to another, the use of international project credits and transfers of unused emissions allocations between Member States. For all Member States, 2013 emissions and estimates for 2014 are expected to be below their respective 2013 and 2014 targets under the ESD. In 2016, compliance will be checked under the ESD. Figure 3: Gap between emissions estimates and targets in 2014 and between projected emissions (with existing measures) and targets in 2020 in non-ETS sectors. Negative and positive values respectively indicate over delivery and shortfall. Source: European Commission and EEA. Luxembourg is projected to fall short of its national target by 21 percentage points. Emissions from road transport represent more than two-thirds of total non-ETS emissions due to low excise duties on motor fuel as well as a large number of cross-border commuters. These projections do however not take into consideration new measures, such as the increase of the standard VAT rate which will narrow the price gap of fuel with neighbouring countries and the construction of a tramway in Luxembourg City. The impact of these measures on projected emissions remains to be quantified. In Ireland, the latest national projections submitted in 2015 show that non-ETS emissions will increase until 2020 due to an anticipated 19 % increase in transport emissions between 2013 and 2020. Ireland lacks public transport, in particular in Dublin, and electro-mobility infrastructure. Emissions from agriculture are expected to increase by 2% during this period of time. As a result, Ireland’s total emissions are projected to fall short of the 2020 target by 10 percentage points. In Belgium, GHG emissions are projected to fall short of the 2020 target by 6 percentage points. The federal and regional authorities have not yet reached an agreement on the distribution of the efforts needed to meet its 2020 target. In addition, certain features of the tax system are environmentally harmful, including the continued favourable tax treatment for company cars. According to Austria’s latest projections, road transport emissions will increase by 3% between 2013 and 2020 to represent 45% of non-ETS emissions. Consequently, it is expected that in 2020 non-ETS emissions will fall short of the target by 4 percentage points. Austrian authorities are planning additional measures to address this issue, in particular by further shifting transport to rail, improving vehicle efficiency, and fostering alternative fuels and electro-mobility. If these planned additional measures are successfully implemented, Austria is projected to meet its 2020 target. The final assessment of compliance of the EU and its Member States for the first commitment period of the Kyoto Protocol will follow the expiration of the "additional period for fulfilling commitments" (true-up period), in November 2015. Subsequently, the true-up period report will be reviewed internationally in 2016. The EU-15 and eleven other Member States which have an individual target under the Kyoto Protocol’s first commitment period have met their targets. The EU is estimated to have exceeded its target by 3.2 GtCO2 eq, without taking into account carbon sinks from Land Use Land Use Changes and Forestry (LULUCF) and international credits from Kyoto mechanisms. If these flexibilities are taken into account, the EU is expected to exceed its targets by a total of 4.2 GtCO2 eq. Taking into account LULUCF and Kyoto mechanisms, the EU-15 reduced its emissions over the period by 18.5 % below base year levels. This is equivalent to a total reduction of 2.2 Gt CO2 eq and means a reduction of more than twice the target of an 8 % reduction on average in 2008-2012 compared to the base year level. 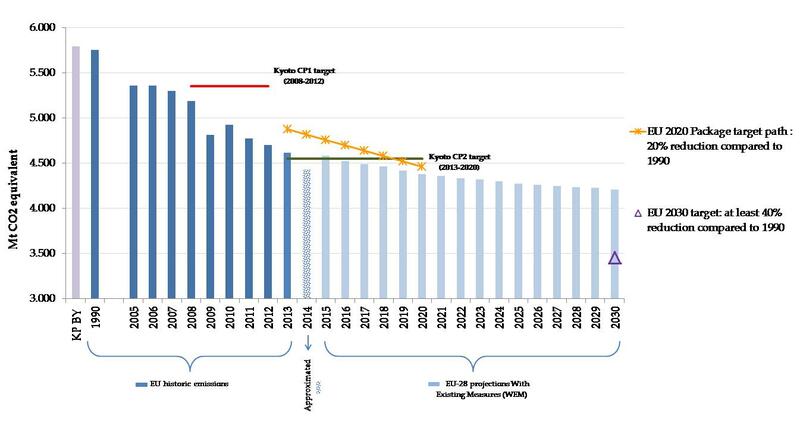 According to Member States’ most recent projections, the EU is on track to meet its Kyoto target under the second commitment period, of a 20 % reduction on average in 2013-2020 compared to base year level. Total GHG emissions in the EU decreased by more than 4 % in 2014 alongside an improved economic situation, with GDP increasing by 1.4 % compared to 2013. Emissions from installations participating in the EU ETS are estimated to have decreased by about 4.5 %. Natural gas consumption fell in all Member States and consumption of solid and liquid fuels also decreased significantly for the EU as a whole. Lower heat demand by households due to a warmer winter and the continued increase in the share of renewable energy in 2014 contributed to these developments. A specific decomposition analysis was carried out to evaluate the impact that the evolution of the European economy has had on emissions over time. Details on the methodology used can be found in the accompanying staff working document. technological changes as measured by the impact that the shift towards less carbon-intensive technologies has had on emissions, for instance higher energy efficiency or the increasing share of renewable energy. Figure 4 shows that CO2 emissions decreased by 11.5 % over the 2005-2012 period. Technological changes have had the most significant effect on emissions, leading to a 18.5 % decrease. Growth in economic activity (GDP) caused a 6.8 % increase in emissions. Structural changes in the economy caused a small increase in emissions, of 1.7 %. These effects can be explained by two factors. First, despite the growing share of services in certain Member States, like France and the UK, the manufacturing sector in some other Member States, in particular Germany, has expanded. Secondly, the share of the relatively more industrialised eastern Member States in the EU economy also increased. The results therefore show that technological changes contributed most to drive down emissions, by far outweighing the contribution of the shift between economic sectors. The policies implemented in the field of climate and energy have contributed significantly to the take-up of clean technologies. A binding target of a domestic reduction in greenhouse gas emissions of at least 40 % by 2030 compared to 1990. The target is to be met by reducing EU-ETS emissions to 43 % compared to 2005 and by reducing emissions in non-ETS sectors to 30 % below 2005 level to be shared among Member States in the form of binding national targets. A target of at least 27 % renewable energy by 2030, binding at EU level. An indicative energy efficiency target at EU level of at least 27 % in 2030, to be reviewed in 2020 having in mind an EU level of 30%. Electricity interconnection between Member States of at least 15 % of their installed electricity production capacity. A new reliable and transparent governance system to ensure that the EU meets its climate and energy goals. According to latest projections with existing measures provided by Member States, total EU GHG emissions in 2030 will be 27 % below 1990 levels. The current policy framework is therefore insufficient to meet the agreed 2030 GHG target of an emissions reduction of at least 40 %. The EU and Member States need to put further mitigation measures in place. To address this, the Commission proposed a revised EU ETS Directive in July 2015 and will present legislative proposals for sectors outside the ETS in the first half of 2016. The Commission is also rolling out the initiatives planned under the ‘Framework strategy for a resilient Energy Union with a forward-looking climate policy’. There are upcoming proposals on measures related to areas including renewable energy, energy efficiency, transport, and research and development. Furthermore, the Commission is working on the implementation the Energy Union, as highlighted in the State of the Energy Union 2015. Since 2013, the EU ETS has operated under the improved and more harmonised rules of phase 3. Article 10(5) of the EU ETS Directive requires the Commission to monitor the functioning of the European carbon market and to submit, each year, a report to the European Parliament and to the Council on the functioning of the carbon market including the implementation of the auctions, liquidity and the volumes traded. At the same time, according to Article 21 (2), the Commission shall publish a report on the application of the EU ETS Directive on the basis of the reports submitted by Member States. The Report on the functioning of the European carbon market covering the first two years of phase 3, 2013 and 2014 is included in the annex to this report. It confirms that the system is robust and that it has created a functioning market infrastructure and a liquid market. Decision (EU) 2015/1814 of the European Parliament and of the Council of 6 October 2015 creates a Market Stability Reserve which will start operating in January 2019. Its aim is two-fold: to neutralise the negative impacts of the existing allowance surplus and to improve the system’s resilience to future shocks. This will be achieved among other measures by an automatic rule-set adjusting the supply of allowances to be auctioned when the total number of allowances in circulation is outside a certain predefined range. On 15 July 2015, the Commission presented a legislative proposal on the revision of the EU ETS for phase 4, in line with the European Council conclusions of October 2014 on the 2030 climate and energy policy framework. The proposal aims to achieve a 43 % reduction in EU ETS emissions compared to 2005 levels. To this end, the overall number of allowances will decrease at an annual rate of 2.2 % from 2021 onwards. Compared to the current 1.74 %, this leads to a significant additional emissions reduction, estimated at around 550 million tonnes between 2021 and 2030. The Commission proposed that the allocation of free allowances is better targeted and more dynamic, including through the updating of benchmarks to reflect technological progress, more targeted carbon leakage groups, and a better alignment of the amount of free allocation with production levels. The option for continued free allocation of allowances given to 10 lower-income Member States to help them modernise electricity generation is proposed with an enhanced level of transparency. In line with the October 2014 European Council conclusions, the Commission plans to adopt a legislative proposal on the Effort-Sharing Decision (ESD) in the first half of 2016, with a view to reducing non-ETS emissions by 30 % between 2005 and 2030. As part of its preparatory work, the Commission launched an ex-post evaluation study of the ESD’s implementation under Article 14 of the Decision. The evaluation will examine the ESD’s implementation and achievements, both at Member State and EU level. It will determine the extent to which the ESD is contributing to the overall EU 2020 GHG emissions reduction target. In the EU, the LULUCF sector currently absorbs emissions and is therefore a ‘net sink’. However, it is estimated that, without new action, the effect of the sink will be reduced. The increased use of biomass for energy, if exploited unsustainably, could lead to an even more rapid weakening of this sink effect. Since 2013, the LULUCF Decision ensures that EU accounting rules are standardised on how emissions and removals from the sector are included in the EU GHG inventories, improving overall transparency. Although there is no explicit LULUCF target set under EU legislation, the Kyoto Protocol obliges Member States to ensure that the net result of LULUCF accounts is not negative. The Commission is working on the impact assessment to analyse how LULUCF can be integrated into the EU climate and energy framework for the post-2020 period, building on the existing LULUCF Decision. As part of this work, the Commission has been carrying out consultations with Member States and stakeholders since early 2015. A proposal on LULUCF inclusion is scheduled for the first half of 2016. In 2014, the European Council agreed on an indicative target at EU level of at least 27 % of energy efficiency improvements by 2030 compared to the baseline scenario. The target will be reviewed before 2020, having in mind the EU-level target of 30 % proposed by the Commission. As announced in the Energy Union roadmap, the Commission will review the Energy Efficiency Directive and the Energy Performance of Buildings Directive in 2016. Furthermore, the dedicated Strategy for heating and cooling is planned for early 2016. A proposal for revised legislation on energy labelling has already been presented and is currently under consideration by the co-legislators. EU action also includes measures that encourage the use of financial instruments. In 2014, the European Council agreed a target, binding at EU level, of at least 27 % of renewable energy in final energy consumption by 2030. To address this, the Energy Union roadmap includes a proposal for a new Renewable Energy Directive and a bioenergy sustainability policy. EU action also includes measures that encourage the use of financial instruments to support the development of renewable capacities as well as the promotion of cooperation between Member States. The Commission has carried out an evaluation on the Carbon Capture Storage (CCS) Directive and concluded that the Directive is fit-for-purpose and sets up the necessary regulatory framework to ensure the safe capture, transport and storage of carbon dioxide while allowing the Member States sufficient flexibility. The report on the review of the CCS Directive, as required under its Article 38, is included in the annex to this report. It addresses the evaluation of the Directive’s performance, effectiveness, efficiency, coherence, relevance and EU-added value under the Commission’s REFIT programme. The EU has been supporting a global approach to reducing emissions from international shipping, which is a large and growing source of emissions. In April 2015, it adopted a Regulation that set up an EU-wide monitoring, reporting and verification system for shipping as the first step in the EU strategy towards cutting emissions in this sector. This Regulation requires that large ships over 5 000 gross tons using EU ports after 1 January 2018 monitor and later report their annual verified CO2 emissions and other energy-related data. The EU’s MRV system for shipping emissions is designed to contribute to building an international system in the shipping sector. Discussions on this at the International Maritime Organisation are ongoing. The EU-shipping MRV system will also provide new opportunities to agree on efficiency standards for existing ships. In the area of light-duty vehicles, EU legislation sets binding emissions targets for new car- and van fleets. The targets for cars (130gCO2/km in 2015) and vans (175gCO2/km in 2017) were already reached in 2013. Preliminary data for 2014 registration show that the fleet average for new cars was 123.4gCO2/km and 169.2gCO2/km for vans. As long as this progress rate is maintained, manufacturers are well on their way to reaching the 2021 target of 95gCO2/km for cars and the 2020 target of 147gCO2/km for vans. The heavy-duty vehicle (HDV) strategy, adopted in May 2014, is the EU’s first initiative to tackle the fuel consumption and CO2 emissions of trucks, buses and coaches. The strategy states that the Commission’s first step here will be to measure vehicle fuel consumption and CO2 emissions using a computer simulation methodology (VECTO). This approach was confirmed in the 2015 Energy Union package. requires the Commission to account for the effects of indirect land-use change through the introduction of emission factors in its reporting. The 2014 F-gases Regulation applies from 1 January 2015. It strengthens existing measures (e.g. containment of gases through the detection of leaks, installation of equipment by trained personnel, recovery of used gases, etc.) and introduces a phasing-out of F-gases that will cut total EU F-gas emissions by two-thirds by 2030 compared to 2014 levels. It also prohibits the placing of F-gases on the market in certain circumstances where alternatives are available (e.g. domestic refrigerators and freezers that contain HFCs with a global warming potential (GWP) in excess of 150). Many Member States are addressing adaptation planning and the identification of climate-change-related risks and vulnerabilities. National adaptation strategies have been adopted by 20 Member States and are under preparation in most of the remaining ones. More than half of Member States have earmarked financing for adaptation, though fewer than half have a specific budget for implementing adaptation action in vulnerable sectors. Most Member States have yet to define and implement adaptation action plans. With some variation, the development and implementation of monitoring and evaluation systems remain an outstanding issue in most Member States. This section provides an overview of the use of climate finance generated by the auctioning of EU ETS allowances and the EU budget. It also summarizes data on EU and Member States climate spending in support of developing countries. In 2014, the total revenue from the auctioning of EU ETS allowances amounted to € 3.2 billion. 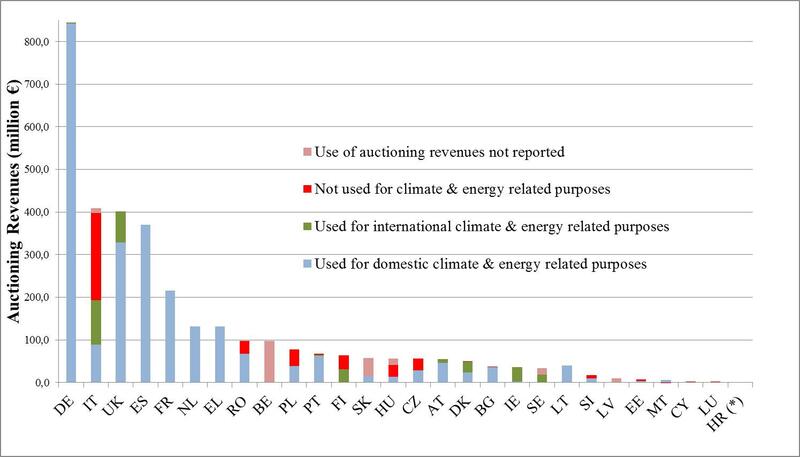 According to the EU ETS Directive, Member States should use at least 50 % of auctioning revenues or the equivalent in financial value for climate and energy related purposes. On average in 2014, Member States used or are planning to use around 87 % of these revenues or the equivalent in financial value for climate and energy related purposes, largely to support domestic investment in climate and energy. Nevertheless, a few Member States are still in the process of setting up the appropriate legal and financial instruments to make use of some of their revenues. Belgium has not provided details on the use of any of its revenues because no agreement has been reached on its allocation between authorities. Concerning the type of action supported, Denmark and the UK are using a significant proportion of their auctioning revenue or the equivalent in financial value to finance research projects on reducing emissions, including CCS technologies. France invests all the revenues in improving the energy efficiency of public buildings used for social housing. In 2014 and 2015, Sweden provided an equivalent amount of € 32 million of its auctioning revenue to the UNFCCC Green Climate Fund. More information on how Member States use auctioning revenue can be found in the accompanying staff working document. Under the NER 300 programme, 38 renewable energy projects and one CCS project were selected for funding in 20 Member States. Total NER 300 funding will be € 2.1 billion, which is expected to leverage an additional € 2.7 billion of private investment. The October 2014 European Council conclusions invited the Commission to renew and extend the NER 300 programme beyond 2020. The new innovation fund proposed as part of the revised EU ETS Directive would have 400 million allowances plus 50 million of unallocated allowances. It would build on the NER 300 programme while extending its scope to low carbon innovation in industrial sectors. In July 2015, the Commission has also proposed a new modernisation fund, designed for 10 Member States with a GDP per capita of less than 60 % of the EU average in order to modernizse their energy systems and improve energy efficiency and ultimately provide citizens with cleaner, secure and affordable energy. Between 2021 and 2030, 2 % of the allowances, which means some 310 million allowances in total, will be used to establish the fund. The current multiannual financial framework sets a target of allocating at least 20 % of the EU budget to climate-related objectives. This represents around € 180 billion and is a threefold increase from the 6-8 % share in the 2007-2013 EU budget. This climate-related expenditure is tracked on an annual basis in accordance with a methodology developed by the Commission. The European structural and investments funds (ESIFs) constitute more than 43 % of the multiannual financial framework. Climate action is taken into account in the ESIF Regulations, the 28 partnership agreements and in more than 530 fund-specific programmes. A common methodology has been set up to determine the level of support for climate change objectives. More than € 110 billion will support climate action objectives, corresponding to about 23-25 % of the total funds. The precise amount will be known at the end of the ongoing programming exercise, when all programmes are adopted. Member States will then use it for planned climate-related projects. At least 35 % of the Horizon 2020 budget of € 79 billion is expected to be invested in climate-related projects. At the time of writing, 80 % of the 2014 budget has been tracked and 22 % of climate-related expenditure has been recorded. The programming for thematic areas is close to delivering the climate target of 35 %. However, the bottom-up actions do not present a high number of climate-related projects, and they alone constitute 25 % of the total Horizon 2020 budget. Therefore, there is a need for urgent corrective action to reach the 35 % mainstreaming target and to avoid a further underperformance in 2015 and beyond. Moreover, the Integrated Strategic Energy Technology (SET) Plan is the very first research & innovation deliverable under the Energy Union, giving a new impetus to the development and deployment of low-carbon technologies by better coordinating and prioritising efforts. It focuses on ten key action lines aimed at delivering the Energy Union research & innovation priorities. It also proposes a new financial product, the "Energy Demo Projects facility" developed with the EIB, targeting first-of-a-kind large-scale commercial demonstration projects. For the common agricultural policy (CAP), 2014-2015 are transitional years. The new CAP will start to be effective as of 2015 and will include the disbursement of about €4 billion from the greening measures alone. Rural development programmes are mainly approved over the course of 2015, with projects being implemented thereafter, which implies a significant increase of rural development expenditure for climate action. Support to developing countries plays a key role in reaching the agreed goal of limiting the global average temperature increase to below 2 °C above pre-industrial levels, achieving the transformation to low GHG emissions economies, and supporting climate-resilient sustainable development. At the 2009 Climate Change Conference in Copenhagen, developed countries committed to a short-term goal of jointly mobilising US$ 30 billion of extra public climate finance for 2010-2012 (‘fast-start finance’). They also committed to a long-term goal of jointly mobilising US$ 100 billion per year by 2020 (‘long-term finance’) in the context of meaningful mitigation actions and transparency of implementation. This financing will come from a wide variety of sources, public and private, bilateral and multilateral, including alternative sources of finance. This US$ 100 billion pledge has helped to significantly scale up climate finance in the context of development cooperation and through multilateral and development banks. The EU and its Member States are the biggest providers of official development assistance to developing countries, accounting for over US$ 70 billion per annum (around € 58 billion in 2014). They allocated € 7.34 billion to ‘fast-start finance’ over the 2010-2012 period. Furthermore, in 2014 the EU and its Member States collectively committed € 14.5 billion to help developing countries in tackling climate change. This figure includes climate finance sources from public budgets and other development financial institutions. Since 2014, it includes climate finance from the EIB, which amounted to € 2.1 billion. Compared to previous years, a more complete set of figures based on OECD data on imputed multilateral contributions was taken into consideration in this calculation. An ambitious climate policy is an integral part of the Energy Union initiative 1 , as also reflected in the climate and energy policy framework for 2030 endorsed by European leaders in October 2014. 2 Launched in 2005, the EU Emissions Trading System (EU ETS) – the cornerstone of the EU's strategy to reduce emissions of greenhouse gases – turned ten in 2015. As a result of the Market Stability Reserve and the measures needed and proposed to meet the increased ambition decided in the 2030 framework, the EU ETS will deliver a meaningful price on carbon emissions, stimulate greenhouse gas emission reductions and play its role as a technology neutral, cost-effective and EU-wide driver for low-carbon investments. The system not only reinforces the functioning of the internal energy market through its price formation at EU level, but also stimulates the uptake of renewables and other low-carbon and energy-efficient technologies. The first report on the state of the European carbon market 3 was published in November 2012 (Carbon Market Report 2012). Its purpose was to analyse the functioning of the carbon market and to consider whether regulatory action was needed in the light of a growing surplus in allowances. The present Report on the functioning of the European carbon market required under Article 10(5) and Article 21(2) of Directive 2003/87/EC 4 (EU ETS Directive) covers two years: 2013, the first year of the third trading phase which has brought many developments to the EU ETS, and 2014. In addition, it also presents certain initiatives proposed or agreed in 2015. Unless otherwise indicated, data used for this report were the ones publicly available and at the disposal of the Commission by June 2015. The European Court of Auditors published in July 2015 a Special Report on the integrity and implementation of the EU ETS 5 . To the extent relevant, this report also makes references to issues examined by the Court. Issues concerning aviation are mainly described in section 5 of this report. The EU ETS was launched in 2005 constituting the cornerstone of the European Union's strategy for cost-effective reduction of emissions of carbon dioxide (CO2) and other greenhouse gases. The system is not only the world’s first major carbon market, but it remains the biggest one, covering over three-quarters of the allowances traded on the international carbon market. The EU ETS now covers about 11 000 power plants and manufacturing installations in the 28 EU Member States, Iceland, Norway and Liechtenstein, as well as emissions from over 600 airlines flying between European airports. The EU ETS works on the 'cap and trade' principle. A 'cap', or limit, is set on the total amount of certain greenhouse gases that can be emitted by the factories, power plants and other installations in the system. The cap is reduced over time so that the total emissions fall. In 2020, emissions from sectors covered by the EU ETS will be 21% lower than in 2005. By 2030 it is foreseen that they will be 43% lower. Emission allowances, derivative financial instruments or auctioned products based on them are subject to the Markets in Financial Instruments Directive and Regulation under the MiFID2 package 12 (as of January 2017), and the Market Abuse Regulation 13 (as of January 2017). Although the initial teething problems of the EU ETS were largely addressed by this reform, the impact of the economic crisis that started in 2008 was unprecedented. It resulted in the accumulation of a surplus of allowances, which grew over the years to reach two billion allowances in 2012. The first Carbon Market Report published in 2012 expected a surplus of about 2 billion allowances by 2013, a decreasing speed of build-up of the surplus by 2014, and no decline of the overall surplus was expected by 2020. This growing market imbalance, along with a weak price signal, triggered an intense public debate on the policy options presented in the Carbon Market Report 2012 to address the problems the EU ETS was experiencing. The system was not driving investments in low-carbon technologies sufficiently well and was also increasing the likelihood of the introduction of the new national policies. Hence, the Commission in November 2012 proposed a short-term measure to postpone (back-load) auctioning of 900 million emission allowances until 2019 and 2020. The European Parliament and the Council agreed on the proposal in December 2013 14 and the implementation of back-loading started in March 2014. Carbon Market Report 2012 contained several structural options to address the accumulated large imbalance of allowances. Subsequently, in January 2014 a proposal for legislation to establish a market stability reserve was presented in parallel to the Communication on a 2030 climate and energy policy framework 15 (see section 10.1.). The European Parliament and the Council agreed on the proposal in October 2015 16 . In October 2014, EU Heads of State and Government agreed the headline targets and the architecture for the EU framework on climate and energy policy for 2030. The agreed targets include a cut in greenhouse gas emissions by at least 40% by 2030 compared to 1990 levels. This domestic target to reduce emissions by at least 40% will be delivered collectively by the EU in a cost-effective manner, with reductions in the ETS and non-ETS sectors. A well-functioning, reformed EU ETS together with an instrument to stabilise the market as proposed by the Commission will constitute the main mechanism to achieve this target, which amounts to the decrease of 43% of emissions compared to 2005 in the sectors covered by the EU ETS. On 15 July 2015 the Commission presented a legislative proposal to revise the EU Emissions Trading System in line with the 2030 framework (see section 10.2.). This section explains basic infrastructure of the EU ETS system: including its scope (i.e. what types of installations and gases are covered by the system) and the Union Registry which records the holding of allowances and transactions with them. In terms of greenhouse gases, the EU ETS now covers carbon dioxide (CO2) emissions, nitrous oxide (N2O) emissions from all nitric, adipic, glyoxal and glyoxylic acid production and perfluorocarbons (PFC) emissions from aluminium production. From the start of phase 3, the system covers approximately half of the overall GHG emissions in the EU. EU Member States may add more sectors and greenhouse gas emissions to the EU ETS (opt-in procedure). In their 2015 reports corresponding to reporting year 2014 18 , Member States 19 reported that a total of approximately 11 200 installations were included in the EU ETS, compared to approximately 11 400 in the previous reporting year 2013. These installations are very diverse in their characteristics, therefore the Monitoring and Reporting Regulation defines 4 categories of installations based on their average annual emissions. 20 According to the Article 21 reports, for 2014, similar to 2013, 72% of installations were category A, 21% category B and only 7% (868 installations) were category C. In 2014 over 5700 installations (51% of the total) qualified as 'installations with low emissions', compared to 5600 installations, 49% of the total, in the reporting year 2013. The high percentage of installations with low emissions and category A confirms the relevance of the tier-based architecture of the monitoring, reporting and verification system designed in view of the proportionality principle. While in terms of categories of installations the picture is quite homogeneous among Member States, the situation varies in terms of industry sectors or activities covered. EU ETS installations involving combustion activities are found in all Member States. Other activities reported by the majority of Member States are oil refining, steel production, cement, lime, glass, ceramics and pulp and paper production. Only two countries (FR and NO) reported in 2014 that CO2 capture and storage activities have had permits issued. Regarding the new gases (those added to Annex I of the EU ETS Directive for inclusion in the system from the start of phase 3), PFC emitting activities have had permits issued in 13 countries, while the activity 'nitric acid production' has had permits issued in 20 Member States. The other N2O sectors are only present in three Member States (DE, FR, IT). Only a small number of Member States have made use of the possibility to exclude small emitters from the EU ETS in line with Article 27 of the EU ETS Directive. This possibility is offered by the Directive in order to reduce the administrative costs of small emitters and is allowed where equivalent measures for GHG emissions reduction are in place. According to reports submitted in 2015, 8 countries (DE, ES, FR, HR, IS, IT, SI, UK) are making use of this possibility, especially for installations with combustion activities and ceramics production. The amount of emissions excluded is about 3.9 million tonnes CO2, or 0.2% of total verified emissions in 2014, compared to 4.7 million tonnes CO2 in 2013. As far as the coverage of aircraft operators is concerned, the number of aircraft operators actually subject to the EU ETS was estimated at around 600 in 2014. The Union Registry, which records the holding of allowances and the transactions concerning those allowances, has centralised these operations since 2012. This single registry is operated and maintained by the Commission, whereas national registry administrators in all 31 countries participating in the EU ETS remain the point of contact for the representatives of more than 20 000 accounts (companies or physical persons). In 2013 the Registry Regulation was revised to finalise the functionalities needed for phase 3 of the EU ETS and to incorporate the accounting of transactions under the Effort Sharing Decision. 21 In relation to the EU ETS, the revised Registry Regulation also provides for the mechanism to implement the provisions of Article 11a of the EU ETS Directive, whereby operators can exchange international credits for allowances (see also section 4.1.3.). In accordance with the EU ETS Directive and the Registry Regulation, allocation processes in phase 3 of the EU ETS are performed centrally in the Union Registry, both for the allocation of allowances to stationary and aircraft operators for free (see also sections 4.1.2.1. and 4.1.2.4.) and for the auctioning of allowances through the common and two 'opt-out' auction platforms (see also section 4.1.2.3.). The Commission as the central administrator of the Union Registry also seeks the continuous improvement of registry functionalities, security and user friendliness in consultation with national registry administrators. This chapter covers the main features of the EU ETS, both on the supply and demand side. It provides information on the cap, free allocation, auctioning and the derogation from full auctioning for the power sector in certain Member States. It also covers the use of international credits. On the demand side, it provides information on the verified emissions and on the balancing of the supply and demand. The EU ETS works on the 'cap and trade' principle. The cap is the absolute quantity of greenhouse gases which can be emitted in the system to ensure the emission reduction target is met and corresponds to number of allowances put in circulation over a trading phase. As from phase 3, an EU-wide cap is determined by the EU ETS Directive. The cap will decrease each year by an amount corresponding to 1.74% of the amount of allowances in 2010. This decrease rate is known as the linear reduction factor. In absolute terms this means the number of allowances will be reduced annually by a determined number of about 38 million allowances. This linear reduction factor was decided in the context of the overall 20% reduction target and results in a 21% reduction compared to the EU ETS emissions in 2005. In phases 1 and 2, the EU-wide cap was determined in a bottom-up manner from the aggregated total quantity of allowances laid down by Member States in their National Allocation Plans (NAPs). The total quantity of allowances issued in 2013 amounts to 2 084 301 856 allowances. Table 1 shows the figures for the cap for each year during the period 2013-2020. Phase 3 of the EU ETS introduced significant changes concerning free allocation of allowances: in principle electricity production no longer receives any free allowances (see below section 4.1.2.4.) and auctioning became the default rule. The principles underlying the free allocation to sectors in the EU ETS have fundamentally changed compared to the two previous phases. Firstly, allowances are distributed for free according to EU-wide harmonised rules, meaning that the same rules apply to installations of the same type across all Member States. Secondly, free allocation is based on performance benchmarks to strengthen the incentives for greenhouse gas emissions reductions and reward the most efficient installations. Thirdly, an EU-wide new entrants' reserve (NER) is foreseen equivalent to 5% of the total amount of allowances for phase 3. The NER300 programme made available 300 million allowances from this reserve to stimulate the construction and operation of large-scale demonstration carbon capture and storage (CCS) projects as well as innovative renewable energy technologies. It is proposed (see section 10.2.) that remaining allowances in the NER are used for free allocation to new and growing installations under the EU ETS from 2021. Free allocation is provided to industrial installations to address the potential risk of carbon leakage (industries transferring production to third countries with laxer constraints on greenhouse gas emissions, leading to an increase of emissions globally) for energy-intensive manufacturing industries. The provision of free allowances substantially limits the costs for EU industries exposed to international competition. Sectors and sub-sectors facing competition from industries outside the EU are deemed at risk of carbon leakage and as such receive a higher share of free allowances than those industries not deemed at such risk. The first list determining sectors and sub-sectors which are deemed to be exposed to a significant risk of carbon leakage (the carbon leakage list) 22 was adopted by the Commission in 2009 and applied for free allocation of allowances in 2013 and 2014. New sectors and subsectors were added to the carbon leakage list in 2011, 2012 and 2013. As the first carbon leakage list expired in 2014, after extensive consultations with stakeholders, including Member States, industry, NGOs and academia, the Commission adopted the decision 23 to prolong the existing carbon leakage list for the period 2015 to 2019. Over phase 3, some 43 % of the total phase 3 cap (corresponding to 6.6 billion allowances) are estimated to be allocated for free to industrial installations. Further free allocation is available to new entrants from the NER. In phase 3 new installations covered by the EU ETS and installations that increase capacity, are eligible for additional free allocation from the NER. The initial NER, after deducting 300 million allowances for the NER300 programme, held 480.2 million allowances. Until July 2015, 91.3 million allowances have been reserved for 369 installations for the entirety of phase 3. The remaining NER can be distributed in the future in case there are new installations or existing installations increasing their capacity. It is expected that a significant number of these allowances will, however, remain unallocated. Until July 2015, allocation has been reduced by around 165.4 million allowances due to installations that have closed or reduced their production or production capacity compared to the one initially used to calculate phase 3 allocation. The NER 300 programme is one of the world's largest funding programmes for innovative low-carbon energy demonstration projects. It is funded from the monetisation of 300 million emission allowances from the NER set up for the third phase of the EU ETS. The funds from the monetisation are distributed to projects selected through two rounds of calls for proposals. Performance-based grants under the first call were awarded in December 2012, when €1.1 billion were allocated to 20 renewable energy (RES) projects. In July 2014 the Commission awarded €1 billion funding to one carbon capture and storage (CCS) and 18 RES projects under the second call. The aim of the programme is to successfully demonstrate environmentally safe CCS and innovative RES technologies on a commercial scale with a view to scaling up production of low-carbon technologies in the EU. The Italian bioenergy BEST project turns selected energy crops into second generation biofuels at a demonstration plant in Crescentino, near Turin. The highly innovative integrated biofuels plant uses giant cane, a new fast growing and drought-resistant energy crop, as well as wheat straw to produce ethanol. The plant has an annual production capacity of 51 million litres per year. BEST, led by Italian Bio Product S.p.A., entered into operation on 1 June 2013 and was awarded a NER 300 co-funding of €28.4 million. Verbiostraw is a German bioenergy project turning agricultural residue into biogas through a first-of-a-kind plant. The project has a capacity of 16.5 MW and will deliver 136 gigawatt hours per year of biogas using some 40,000 tonnes of straw annually. The feedstock is agricultural residue only and, as a result, the plant will not require farmland to grow energy crops. The conditioned biogas will either be fed into the natural gas network or used as advanced biofuel in the transport sector. Verbiostraw is led by VERBIO Ethanol Schwedt GmbH & Co and is located in Germany in Schwedt/Oder. It entered into operation on 3 January 2014 and was awarded NER 300 co-funding of €22.3 million. The Swedish wind energy project Windpark Blaiken concerns the development of a 225 MW wind farm located in the Arctic climate of northern Sweden. When fully operational, it will comprise 90 wind turbines equipped with an innovative de-icing system made up of heating elements in the leading blade edges. The project, which is constructed in 3 lots of 30 turbines over a three-year period, is connected to the national grid. The first two batches of turbines are already operational and the third one will be commissioned in 2015. The project is led by Blaiken Vind AB, entered into operation on 1 January 2015 and was awarded a NER 300 co-funding of €15 million. As of phase 3, auctioning via the primary market became the default mode for allocating allowances. Under the EU ETS Directive, the Commission was required to adopt a regulation on timing, administration and other aspects of auctioning to ensure that it is conducted in an open, transparent, harmonised and non-discriminatory manner. Accordingly, the Auctioning Regulation 26 was adopted in November 2010. It provides for the participating Member States and the Commission to procure jointly a common platform to auction allowances on behalf of the Member States, but it also provides for the possibility for individual Member States to opt out. Germany, Poland and the UK have decided to apply this option and appoint their own auction platform. Such appointment is subject to listing in Annex III of the Auctioning Regulation 27 . The Auctioning Regulation provides for the appointment of the auction platforms on the basis of competitive tender procedures; for the appointment of the common auction platform a joint procurement agreement between the Member States participating in the joint action and the Commission has been signed and entered into force. In August 2012 the European Energy Exchange (EEX) was appointed as the first common auction platform. The Auctioning Regulation further provides for an auction monitor to be also appointed under a joint procurement agreement between the Member States and the Commission and options for this are currently being assessed. Each auction platform has to determine and publish the volumes and dates of each individual auction (the so-called auction calendar), before the beginning of each calendar year. By 30 June 2015, more than 650 auctions have been conducted for phase 3. The table hereafter provides an overview of the volumes of allowances of phase 3 auctioned by EEX and ICE in 2012 (so called early auctions 28 ), 2013, 2014 and 2015. EEX, auctioning on behalf of 27 Member States (25 Member States cooperating on a common auction platform, Germany and Poland) auctioned 88% of the total auctioned amount in 2012 to 2014, with ICE, auctioning 12% of the total volume on behalf of the UK. The auctions were generally conducted smoothly and the auction clearing prices were generally in line with the secondary market prices, without the occurrence of significant problems or incidents. Auctions were cancelled pursuant to Article 7(6) of the Auctioning Regulation on three occasions in EEX in 2013 shortly after the start of the auctions. The volumes to be auctioned in 2014 have been revised as from 12 March 2014 (ICE) and 17 March 2014 (EEX) in accordance with the decision to backload 900 million allowances from 2014, 2015 and 2016 to 2019 and 2020, as per the Commission Regulation (EU) No 176/2014. The auctioning of aviation allowances was suspended in 2012, following the 'stop the clock' Decision 29 , and resumed in 2014. Croatia started auctioning its share of allowances as from January 2015. Iceland, Liechtenstein and Norway have not started auctioning of allowances yet. The total revenues generated from the auctions between 2012 and June 2015 exceeded € 8.9 billion. The EU ETS Directive provides that at least 50% of auctioning revenues or the equivalent in financial value of these revenues, including all revenues generated from allowances distributed for the purposes of solidarity and growth, should be used by Member States for climate and energy related purposes. On average in 2014, Member States have used or plan to use around 87% of these revenues or the equivalent in financial value on climate and energy related purposes, largely to support domestic investments in climate and energy (see section 6.1.1. of the Climate action progress report). The auction platforms publish the detailed results of each auction in dedicated websites. In addition, Germany, Poland and the UK as well as the Commission on behalf of the Member States making use of the common auction platform, publish monthly reports on the auctions 31 . A derogation from the general rule of auctioning has been provided for in Article 10c of the EU ETS Directive to enable investments in the modernisation of the electricity sector in certain Member States. Eight out of ten eligible Member States 32 make use of this derogation and allocate to electricity generators a number of allowances for free provided corresponding investments are carried out. The free allowances under Article 10c are deducted from the quantity that the respective Member State would otherwise auction. Depending on the national rules for the implementation of the derogation, electricity generators can receive free allowances of an equivalent value to the investments they carry out or have carried out from investments listed on the National Investment Plan, or to payments made into a national fund through which such investments can be financed. The number of such allowances allocated for free to electricity generators for 2013 and 2014 are indicated in Table 4. If the number of allowances allocated is lower than the maximum allowed, these 'unused' allowances may be allocated for free in the following year(s), depending on the relevant national rules of the Member State. Ultimately, allowances not allocated for free pursuant to the derogation will be auctioned. In the first year, investments that had been undertaken from June 2009 onwards from the national plan could be reported. For 2013 and 2014, costs were reported for 500 investments, out of which 135 were completed and 22 investments were reported to be cancelled and the rest are ongoing but not yet completed. The total value of reported investment costs for 2009 to 2013 is €5.9 billion and for 2014 €1.9 billion. About 80% of this was dedicated to upgrading and retrofitting infrastructure, while the rest of the investments related to clean technologies or diversification of supply. Examples of investments include a new cogeneration-condensing steam turbine in Estonia (upgrade of infrastructure), rehabilitation of district heating networks in Bulgaria (retrofitting of infrastructure), substitution of coal by renewable energy sources through waste utilization in the Czech Republic (clean technologies) and the construction of an interconnector pipeline for natural gas in Hungary (diversification of supply). The EU ETS Directive requires Member States making use of the derogation to publish annual reports on the implementation of investments from their national plans. The applications should also be published. Experience shows that the existing reports that have been published vary in format and content. In some cases Member States restrict or aggregate the information provided on investment costs with reference to business confidentiality. Typically, the reports are published on the website of the responsible ministry e.g. Ministry for Energy (Bulgaria, Romania, Lithuania) or the Ministry for Environment (the Czech Republic, Cyprus, Estonia, Hungary, Poland). Up to 2020, the EU ETS allows participants to use credits from the Clean Development Mechanism (CDM) and Joint Implementation (JI) – two UN-organised crediting programmes – towards fulfilling part of their EU ETS obligations, with the exception of nuclear and afforestation and reforestation projects 33 . According to the Commission Regulation (EU) No 550/2011 34 , credits generated by projects involving the destruction of industrial gases (HFC23 and adipic N2O) are no longer allowed as of the start of phase 3. In addition, in phase 3 further restrictions came into effect for credits resulting from projects registered after 2013 in countries other than least developed countries. Furthermore, since 31 March 2015 and in accordance with Article 11a(3) and (4) of the EU ETS Directive, credits issued in respect of emission reductions in the first commitment period of the Kyoto Protocol (2008-2012) are no longer eligible for exchange with EU ETS allowances. Article 11a(8) of the EU ETS Directive also includes provisions related to the levels of use of international credits by category of operator and aircraft operator, and sets out minimum entitlements in this regard. Commission Regulation (EU) No 1123/2013 sets the rules for determining the entitlements of individual operators and aircraft operators up to 2020. Although the exact amount of credit entitlements over phase 2 and 3 will partially depend on the amount of future verified emissions, market analysts estimate that it will amount to around 1.6 billion credits. In phase 3 credits are no longer surrendered directly but instead exchangeable at any time throughout the calendar year for allowances. As of 30 April 2015 the total number of international credits used or exchanged amounts to 1445 million. According to the information recorded in the Union Registry, in 2014 emissions of greenhouse gases from stationary installations participating in the EU ETS are estimated to have decreased by about 4.5% compared to 2013 level, which is a faster decline than in previous years. In 2013 verified emissions of greenhouse gases were estimated to have decreased by at least 3% compared to 2012. It has to be noted that due to the extension of scope of the EU ETS from phase 2 to phase 3, there are some methodological challenges in assessing with certainty the change in emissions compared to 2012. However, estimated emissions in 2013 on a like-for-like basis were at least 3% below the 2012 level for installations in sectors included in both phase 2 and phase 3. Whereas, verified GHG emissions from stationary installations amounted to 1895 million tonnes of CO2-equivalent in 2013, emissions additionally covered by the EU ETS due to the extension of its scope are estimated at 79 to 100 million tonnes. In sum, the economic recession starting in 2008 had a profound impact on the emissions, but even with the correction for the extension of scope between phase 2 and phase 3, the emissions in 2014 are below the pre-crisis levels. The volatility of annual emissions cannot be explained only with the economic factors, but is also due to energy efficiency improvements and cleaner energy mix. The number of allowances cancelled (not used for compliance) on a voluntary basis amounts to 13 219 allowances in 2013 and 47 278 allowances in 2014. As indicated in the Carbon Market Report 2012, at the start of phase 3, the EU ETS was characterised by a large imbalance between supply and demand of allowances, resulting in a surplus of around 2 billion allowances. For 2013, this surplus increased further to more than 2.1 billion. For 2014, it has been slightly reduced to some 2.07 billion. In 2014 auction volumes were reduced by 400 million allowances due to the start of the implementation of the back-loading measure, which postpones the auctioning of these allowances. In the absence of back-loading the surplus in 2014 would have amounted to almost 2.5 billion allowances. The reasons for this imbalance were outlined in the Carbon Market Report 2012. It is primarily a mismatch between the auction supply of emission allowances, which is fixed as a result of the emissions cap, and demand for them, which is flexible and impacted by economic cycles, fossil fuel prices as well as other drivers such as complementary policies and technological developments. The influx of international credits has also impacted the supply of emission allowances resulting in a significant increase. To remedy this situation, the Commission has made a legislative proposal to establish a market stability reserve and render the auction supply of emission allowances more flexible. The market stability reserve aims to stabilise the market by addressing the imbalance between supply and demand (see section 10.1.). A key notion for the functioning of the market stability reserve is the total number of allowances in circulation (TNAC). Allowances will be added to the reserve, if the TNAC is above a predefined upper threshold (833 million allowances) and allowances will be released from the reserve, if the number is below a predefined lower threshold (below 400 million allowances or where measures are adopted under Article 29a of EU ETS Directive). Thus the market stability reserve absorbs or releases allowances, if the TNAC is outside of a predefined range. The reserve will be also replenished by the backloaded and unallocated allowances 37 . The supply of emission allowances consists of the allowances banked from phase 2, auctioned allowances, allowances allocated for free and the allowances in the NER; while the demand is determined by the emissions of the installations and the cancelled allowances. For more details, see Table in Annex. The starting point for determining the total number of allowances in circulation is the total number of allowances remaining after phase 2 of the EU ETS (2008-2012), which were not surrendered or cancelled. These allowances were replaced by phase 3 allowances at the end of the second trading period. No other allowances from before the third trading phase contribute to the total number of allowances in circulation 38 . This 'banking total' thus represents the exact number of ETS allowances in circulation at the start of the third trading period of the EU ETS. The banking total is 1 749 540 826 allowances (this number does not include early auctions of phase 3 allowances taking place in 2012 but does reflect the use of international credits before the start of phase 3. The total amount of international credits used since 2008 is listed in section 4.1.3.). The annual carbon market report allows the consolidation of the figures for supply and demand which are published according to the timeline of reporting obligations stemming from the EU ETS Directive and its implementing provisions. This timeline, relevant data and scope are outlined in Table 7. As the market stability reserve becomes operational in 2019, the Commission will regularly publish in mid-May the total number of allowances in circulation for the preceding year, as of 2017. Figure 1 presents the cumulative supply and demand figures until the end of 2014, respectively. The total supply in 2013 was about 2.18 billion allowances, and the total demand was about 1.96 billion allowances. In 2014, both the total supply and demand decreased to around 1.87 billion allowances. The surplus therefore grew in 2013 by about 220 million allowances to over 2 billion allowances, while remaining stable in 2014. Reduced supply and demand in the year 2014 reflected lower auctioning due to the backloading of allowances as well as a continued decline in emissions. When considering these figures related to 2013 and 2014, it should be noted that these are based on the most recent data related to these years, as can be derived from the European Union Transaction Log (EUTL). This means that they can include recent data relating to 2013 and 2014. Aviation activities were included in the EU ETS by Directive 2008/101/EC 41 . The Directive establishes that since the start of 2012, emissions from all flights within airports in the European Economic Area (EEA), from flights departing from airports in the EEA to third countries and, if not exempted through delegated legislation, from incoming flights to airports in the EEA from third countries are included in the EU ETS. In September 2013 the ICAO Assembly agreed to develop by 2016 a global market-based mechanism (MBM) to be implemented from 2020 to tackle emissions from international aviation. This outcome was welcomed by the EU, and in response to it, the EU legislation was amended. In this regard, Regulation (EU) No 421/2014 42 temporarily reduces the scope of the EU ETS to emissions from flights within the EEA between 2013 and 2016. According to the Article 21 reports submitted in 2015, 611 aircraft operators have a monitoring plan. Of these, 50% (305) were Commercial Aircraft Operators and the other 50% (306) were Non Commercial Aircraft Operators. A total of 329 (53.8% of the total) qualified as small emitters. According to EUTL public website verified CO2 emissions from aviation activities carried out between airports located in the EEA amounted to 53.4 million tonnes of CO2 in 2013 and 54.9 million tonnes of CO2 in 2014, which represents an increase of 2.8% in 2014 compared to 2013. Aircraft operators' initial allocation was also adjusted to the reduced intra-EEA scope. The adjusted free allocation amounted 43 to 32.4 million allowances in 2013 and 32.3 million allowances in 2014. The amounts of allowances to be auctioned for the years 2013 and 2014 were determined on the basis of an expected annual amount of 5.7 million, following the adjustments made to auction volumes in accordance with Regulation (EU) No 421/2014. These allowances were auctioned between 1 January and 30 April 2015. These figures show around 32 million tonnes of emission reductions in 2013 and in 2014. The lion's share of transactions in emission allowances is in the form of derivatives (futures, forwards, options, swaps), which are already subject to EU financial markets regulation (including the currently applicable Markets in Financial Instruments Directive (MiFID)). 44 This is being replaced by the MiFID2 package, which will be applicable as of January 2017 and it requires the adoption of multiple implementing measures. Under MiFID2 also emission allowances will be classified as financial instruments. This means that MiFID2 rules applicable to traditional financial markets (those including carbon derivatives trade on leading platforms) will also apply to the spot segment of the secondary carbon market (transactions in emission allowances for immediate delivery in the secondary market, currently unregulated at EU level), putting it on equal footing with the derivatives market in terms of transparency, investor protection and integrity 45 . full coverage of emission derivatives (similarly to derivatives with 'financial' underlying and unlike commodity derivatives). During the course of 2014 and 2015, several level 2 measures covering details of provisions under MiFID2 and MAR have been developed and are to be adopted, including the determination of the thresholds to be used in determining ancillarity under MiFID2, thresholds for application of inside information disclosure duty to carbon market participants under MAR, and secondary markets’ transparency requirements in respect of emission allowances and their derivatives, including thresholds allowing for their determination as Liquid Markets under MiFID2. As for many other cases, the legal nature of emission allowances and their fiscal treatment are not defined at EU level. However, despite non-harmonisation, a mature and very liquid market has developed over the last decade. The current regulatory framework provides the necessary legal underpinnings for a transparent and liquid carbon market, whilst ensuring the market's stability and integrity. Although stakeholders have not expressed the need for more clarity on the legal definition of allowances, the Commission plans to analyse the benefits of clarifying their legal status following the recommendation of the European Court of Auditors. Under Article 21 reports, 23 Member States reported on and described the legal nature of an emission allowance within their legal system. Emission allowances are described variably as financial instruments, intangible assets, property rights and commodities. One country (DE) recognises the need for revised legislation.Other Member States treat allowances as financial instruments, define them as property rights, or consider them as state property. As regards the fiscal treatment of allowances, under Article 21 reports a low number of Member States reported that value added tax (VAT) 47 applies to the issuance of emission allowances, VAT being due on transaction of emission allowances on the secondary market in 24 Member States. A majority of Member States reported on the application of the reverse-charge mechanism 48 on transactions involving emission allowances. Emission allowances for corporations can additionally be taxed. Sixteen Member States reported that there was no taxation on emissions allowances or corporate emission allowances. Accurate monitoring, reporting and verification (MRV) is the backbone of the EU ETS. It is supplemented by a sound accreditation system for ensuring adequate quality of third-party verifiers. To improve and harmonise the MRV requirements in phase 3, the Monitoring and Reporting Regulation (MRR) and the Accreditation and Verification Regulation (AVR) were adopted (see section 2). The Commission has also provided an extensive set of guidance documents and electronic reporting templates, which have been widely used by Member States. The efficiency of the compliance system has also been improved since the MRR allows Member States to make electronic reporting mandatory. Ten Member States reported in 2015 that they have a dedicated IT system in place for EU ETS reporting. The monitoring system in the EU ETS is designed as a 'building block' system which allows a high degree of flexibility for operators to ensure cost-efficiency, while at the same time achieving a high reliability of the monitored emissions data. For this purpose, several monitoring methods ('calculation 49 -based' or 'measurement 50 -based', as well as by exception 'fall-back approaches') are allowed. Methods may be combined for parts of the installation. The requirement for installations and aircraft operators to have a monitoring plan approved by the Competent Authority on the basis of the MRR prevents arbitrary selection of monitoring methods. According to the Article 21 reports submitted by Member States to the Commission that cover the application of the ETS Directive in 2014, most of the installations use the calculation-based methodology. Only about 140 installations (in 22 Member States) were reported to use continuous emissions measurement systems. Only 13 Member States reported the use of the fall-back approach by 32 installations in total and covering 6.1 million tonnes CO2e. The minimum tier requirements are usually met by installations. Only 118 category C installations (14% of total) were reported to deviate for at least one parameter from the requirement to apply the highest tiers for the major source streams (for 2013, there were 137 installations, 16% of total). However, the real number may be higher, as not all Member States reported details in this regard. These deviations are only allowed where the operator demonstrates that the highest tier is technically not feasible or incurs unreasonable costs. If those conditions are found not to apply anymore, operators have to improve their monitoring systems. In a similar way, Member States have had to report the number of category B installations which do not meet the highest tier requirements for major source streams or emission sources. Only 22 Member States reported on this issue, showing that on average 28% of category B installations deviate from the requirements in some respect (for 2013, 24 Member States reported indicating an average of 28% of category B installations affected). The above confirms that the MRR provisions for such deviations (bearing in mind that they have to be duly justified by the operator and approved by the competent authority) are applicable in practice, and compliance by operators overall is good. For aircraft operators, there are fewer options applicable for the monitoring of emissions. Only calculation based approaches are feasible, with the fuel consumption being the central parameter 52 to be determined for the flights covered by the EU ETS. With the Accreditation and Verification Regulation for phase 3 and beyond an EU-wide harmonised approach towards the accreditation of verifiers has been introduced. Verifiers who are a legal person or a legal entity must be accredited by a National Accreditation Body (NAB) in order to carry out verifications in compliance with the AVR. Only in the case of a natural person may a Member State allow for certification as an alternative to accreditation 53 . The new uniform accreditation system has the advantage of allowing verifiers to operate with mutual recognition across all Member States, thereby taking full advantage of the internal market and helping to ensure sufficient availability overall. Under Article 21 of the EU ETS Directive, Member States have reported the number of verifiers accredited per accreditation scope. 54 This totals 1044 verifiers accredited across all scopes (verifiers do multiple scopes, so this does not equal the total number of verifiers). The mutual recognition of verifiers among Member States is working successfully: most Member States (28) reported that at least one foreign verifier is active in their territory. Availability of verifiers did not constitute a bottleneck in the system in either the first year or the second year of implementation of the AVR. Compliance of verifiers with the AVR is found to be high, as few administrative measures 55 imposed by Member States have been reported, the exceptions being one suspension of a verifier one withdrawal of an accreditation, and six reductions of scope. Seven Member States reported cases of complaints against a verifier, but these have been resolved in 99% of the cases. Eight Member States reported some non-conformity in relation to the information exchange required between NABs and competent authorities. The EU ETS is implemented in the Member States using different approaches regarding the competent authorities in charge. Most of the Member States have used existing structures, while few have set up new bodies dedicated to the EU ETS implementation. Thus, in some Member States several local authorities are involved, while in others the approach has been centralised. Article 21 reports give some insight into the organisational structure of each Member State. On average 4 different competent authorities are involved in EU ETS implementation. 15 Member States have reported that local authorities are involved, usually for issuing permits and MRV issues. Coordination between authorities is one of the important issues in order to ensure a uniform and correct application of the legal requirements within each Member State. This is ensured by the appropriate provisions of the MRR. For coordination between competent authorities, Member States reported that they use different tools where relevant. For 2014, 10 Member States reported that they have legislative instruments in place for central management of monitoring plans or emission reports, and in 8 cases a central body provides binding instructions and guidance. Twelve Member States reported that they hold regular workshops for authorities, but only 8 reported common training for Competent Authorities. The use of a joint IT platform was reported by 8 Member States as a means of coordination. On administrative fees charged by Member States (in relation to permitting and approved monitoring plans), 14 countries reported that they do not charge any fees to operators. Aircraft operators do not pay fees in 16 countries. Six Member States reported that they collect an annual subsistence charge from operators or aircraft operators. These charges are in the range of 671 to 5250€ per year per operator. In two cases reported, they are expressed as an amount (0.02 to 0.07€) per allowance. Seventeen Member States reported that they collect fees for various specific services, such as approval of monitoring plans or updates of monitoring plans or permits. Those fees vary strongly, from less than 100€ to over 3000€ for a new monitoring plan approval. Overall it is inferred that the Member State systems are largely effective as aligned to the country's administrative organisation. The principle of subsidiarity is applied. Communication between Member States local authorities and the sharing of best practices among Competent Authorities should continue to be reinforced. The competent authorities in the Member States contribute significantly to the high level of compliance of operators, by carrying out different compliance checks on the annual emissions reports. According to the information in the Article 21 reports submitted in 2015, all Member States (except SE) checked between 95 and 100% of annual emission reports for completeness and internal consistency. Furthermore about 80% of reports were checked for consistency with monitoring plans and about 72% on average were checked against allocation data. Twenty-four Member States reported that they carry out cross-checks with other data/detail. All the above checks are intended to supplement the verifier’s work and to ensure the high quality level of the MRV system. After verification, the competent authorities detected errors in only 0.2% of reports in 2014 (and 2013). The number of cases reported by Member States, in which the competent authority had to make conservative estimates on installation emissions 56 is another indicator showing that the compliance system in the EU ETS is functioning well. Fourteen Member States reported in total 37 such cases (0.3% of installations), with emissions of 9.1 million tonnes CO2 involved (0.5% of the total verified emissions reported for 2014). This compares to twelve Member States that reported for 2013 a total of 70 such cases (0.6% of installations), with emissions of 2.7 million t CO2 involved (0.14% of the total verified emissions reported for 2013). The above figures demonstrate that checks by the competent authority are important, despite third party verification. However, the findings also demonstrate that 99.5% of installations comply with the EU ETS’ reporting requirements. The EU ETS Directive provides for a monetary penalty in the form of an 'excess emissions penalty' of €100 for each tonne CO2 emitted for which no allowance has been surrendered in due time. As noted by the European Court of Auditors 57 , the EU ETS has a very high compliance rate: each year around 99% of the emissions are actually covered by the required number of allowances. The level of compliance with the EU ETS rules was also very high in the aviation sector: aircraft operators responsible for more than 99.5 % of aviation emissions covered under the EU ETS complied. This also includes more than 100 commercial aircraft companies based outside EU, which operated flights within the EEA. For 2014, the application of 'excess emissions penalty' was reported for a low number of cases (ca. 0.1% of installations) in 6 Member States (DE, ES, PL, PT, RO, UK). As provided for by the Directive, Member States should increase the penalty in accordance with the European index of consumer prices 58 . Other penalties possible in the Member States are very diverse, regarding the types of infringements covered and the range of penalty. Many Member States reported that the penalties will be set by the court based on the relevant case. Most Member States reported a lower and/or upper limit for the penalty (as applicable), with the minimum ranging from a few hundred euro to as much as €75 000, and the maximum ranging from €5 000 to €15 million. Seven Member States reported possible penalties in the form of imprisonment. For 2014, as well as for 2013, more than 99% of installations complied with the requirement to submit a verified annual emissions report in time. It is also important that operators comply with their greenhouse gas permit and the approved monitoring plan. Under Article 21, Member States have reported on measures they apply for ensuring the highest compliance levels possible. For the reporting year 2014, 25 of the 31 reporting countries mentioned that they offered regular meetings with industry and/or verifiers. On-site inspections and spot checks carried out by the competent authorities are reported by 23 Member States. Twenty-two Member States stated that they prohibit the selling of allowances as long as the installations are non-compliant. Only 11 Member States reported that they publish the names of MRR/AVR non-compliant operators. These measures appear reasonably effective. For 2014, only 10 Member States reported that fines were imposed. No imprisonments were reported. Most frequent reasons for fines were failure to submit a verified report in time (in 7 Member States – ES, HU, PL, PT, RO, SK, UK), and failures to comply with permit conditions (5 Member States – ES, GR, HU, NL, UK). The EU ETS Compliance Forum continues to provide an effective mechanism for sharing MRV information between Member States and competent authorities and identifying best practice for efficient implementation. An annual Compliance Conference is typically held to ensure widest awareness of Compliance Forum activities in particular concerning its five Task Forces on Monitoring and Reporting, Accreditation and Verification, Aviation, Electronic-reporting and Carbon Capture and Storage. In the meantime, details concerning the meetings and on-going work of the Task Forces are made available to all EU ETS competent authorities. The Registry Administrators' Working Group is a cooperation forum between Member States and the Commission as the central administrator on issues and procedures linked to the operation of the Union Registry and the implementation of the Registry Regulation. The European carbon market is currently characterised by a growing imbalance between supply and demand of allowances (see section 4.3.). As a short term measure to mitigate the effects of the surplus it was decided to postpone ('back-load') the auctioning of 900 million allowances in the early years of phase 3. At the same time, considering the structural and long-lasting nature of the surplus, the Commission pursued its public consultation on options for structural reform of the EU ETS set out in the Carbon Market Report 2012. The concept of a market stability reserve that could render the auction supply of emission allowances more flexible and increase shock resilience emerged from this discussion as the preferred option. The Commission made a corresponding legislative proposal to establish a market stability reserve in January 2014. Decision (EU) 2015/1814 of the European Parliament and of the Council of 6 October 2015 creates such Market Stability Reserve. The aim of the Market Stability Reserve is twofold: firstly, to address this existing imbalance between the supply and demand of emission allowances in the EU ETS and, secondly, to make the EU ETS more resilient to large demand or supply shocks in the future. The reserve will start operating in January 2019. Allowances will be added to the reserve, if the total number of allowances in circulation is higher than 833 million allowances. 900 million backloaded and a for the time being unknown amount of unallocated allowances will also be transferred into the reserve. Allowances will be released from the market stability reserve, if the total number of allowances in circulation is lower than 400 million allowances or where measures are adopted under Article 29a of EU ETS Directive. The reserve is fully embedded in the existing framework of the EU ETS. For more technical explanations on its functioning, see section 4.3. The overall number of emission allowances will decline at an annual rate of 2.2% from 2021 onwards, compared to 1.74% currently. The proposal further develops predictable, robust and fair rules to address the risk of carbon leakage. The system of free allocation is revised in order to distribute the available allowances in the most effective and efficient way to those sectors at highest risk of relocating their production outside the EU (around 50 sectors in total). An Innovation Fund will be set up to extend existing support for the demonstration of innovative technologies to breakthrough innovation in industry. Free allowances will continue to be available to modernise the power sector in lower-income Member States. In addition, a dedicated Modernisation Fund will be established to facilitate investments in modernising the power sector and wider energy systems and boost energy efficiency in these Member States. The proposal has been submitted to the European Parliament and to the Council for adoption and to the Economic and Social Committee and the Committee of the Regions for opinion. For the last decade, the EU ETS has delivered emissions reductions in the EU and inspired other international partners to use carbon pricing as a cost-effective driver for a gradual but sustainable decarbonisation of their economies for the benefit of future generations. Since 2005, it has provided a price signal for factories, power plants and other installations covered by the system, to promote investment in clean, low-carbon technologies. The system proved that putting a price on carbon is an effective way to achieve cost-efficient emissions reductions, motivate business and help bring innovative technologies to the marketplace. The teething problems that the EU ETS has experienced in the beginning have been largely addressed. For example the phasing out of free allowances for power plants in 2013 has successfully addressed the issue of windfall profits for power plants which found it easy to pass on the cost of carbon in power prices. The first two years of the phase 3 indicated that the system architecture is robust and that the EU ETS has created a functioning market infrastructure and a liquid market. While the initial problems have been addressed, the wider macro-economic circumstances in the wake of the 2008 financial crisis have had a decisive impact on the supply and demand balance in the EU ETS leading within a period of 24 months to the emergence of a market surplus of more than 2 billion allowances, which would further expand in the coming year and would still be around the prevailing level by 2030. The intense debate in recent years how to react to the unexpected and sudden phenomenon has led to decisions on initially back-loading, which is already in implementation, and a market stability reserve, which will be implemented as of 2019. These decisions have set the EU ETS on course to progressively regain importance in the coming years. Together with the proposed revision of the system which will apply as of phase 4 (2021-2030) these measures will ensure that the EU ETS – the cornerstone of EU climate policy – remains an effective way to cut emissions in the decade to come. Ambitious climate action creates business opportunities and opens up new markets for innovation and the use of low-carbon technologies. The Commission will continue to monitor the carbon market and provide the next report in late 2016. No update is foreseen as phase 2 ended. Final figure. Not part of phase 2 banking total. Final figures. 300 million allowances were monetised in 2012-2014. Final figures. No – adjustments are reflected in the volumes for the following year. 2013 and 2014 auctions took place in 2015. No - the figure is not subject to revision. However, allowances (e.g. due to delays to start of auctioning for certain Member States, e.g. those for EEA-EFTA) withheld from auctions can be auctioned in subsequent years. These figures are updated throughout the year. - Member State may provide late submissions for previous years or actual allocation can be lower than the amount initially foreseen. The EUTL provides an accurate state of play of actual allocation. Compliance data made public on 1 May shows emissions and surrendered allowances for installations that are in compliance (i.e. those installations reporting for all years concerned). Compliance for aviation operators for both 2013 and 2014 took place in 2015. Directive 2003/87/EC of the European Parliament and of the Council of 13 October 2003 establishing a scheme for greenhouse gas emission allowance trading within the Community and amending Council Directive 96/61/EC, OJ L 275, 25.10.2003, p. 32. Directive 2009/29/EC of the European Parliament and of the Council of 23 April 2009 amending Directive 2003/87/EC so as to improve and extend the greenhouse gas emission allowance trading scheme of the Community, OJ L 140, 5.6.2009, p. 63. Commission Regulation (EU) No 1031/2010 of 12 November 2010 on the timing, administration and other aspects of auctioning of greenhouse gas emission allowances pursuant to Directive 2003/87/EC of the European Parliament and of the Council establishing a scheme for greenhouse gas emission allowances trading within the Community, OJ L 302, 18.11.2010, p.1. Commission Regulation (EU) No 601/2012 of 21 June 2012 on the monitoring and reporting of greenhouse gas emissions pursuant to Directive 2003/87/EC of the European Parliament and of the Council, OJ L 181, 12.7.2012, p. 30. Commission Regulation (EU) No 600/2012 of 21 June 2012 on the verification of greenhouse gas emission reports and tonne-kilometre reports and the accreditation of verifiers pursuant to Directive 2003/87/EC of the European Parliament and of the Council, OJ L 181, 12.7.2012, p. 1. Commission Regulation (EU) No 1123/2013 of 8 November 2013 on determining international credit entitlements pursuant to Directive 2003/87/EC of the European Parliament and of the Council (OJ L 299, 9.11.2013, p. 32) determines international credit entitlements for each operator and aircraft operator up to 2020. Commission Regulation (EU) No 389/2013 of 2 May 2013 establishing a Union Registry pursuant to Directive 2003/87/EC of the European Parliament and of the Council, Decisions No 280/2004/EC and No 406/2009/EC of the European Parliament and of the Council and repealing Commission Regulations (EU) No 920/2010 and No 1193/2011, OJ L 122, 3.5.2013, p. 1. Directive 2014/65/EU of the European Parliament and of the Council of 15 May 2014 on markets in financial instruments and amending Directive 2002/92/EC and Directive 2011/61/EU, OJ L 173, 12.6.2014, p. 349 and Regulation (EU) No 600/2014 of the European Parliament and of the Council of 15 May 2014 on markets in financial instruments and amending Regulation (EU) No 648/2012, OJ L 173, 12.6.2014, p. 84. Regulation (EU) No 596/2014 of the European Parliament and of the Council of 16 April 2014 on market abuse (market abuse regulation) and repealing Directive 2003/6/EC of the European Parliament and of the Council and Commission Directives 2003/124/EC, 2003/125/EC and 2004/72/EC, OJ L 173, 12.6.2014, p. 1. Decision No 1359/2013/EU of the European Parliament and of the Council of 17 December 2013 amending Directive 2003/87/EC clarifying provisions on the timing of auctions of greenhouse gas allowances, OJ L 343, 19.12.2013, p. 1. Decision (EU) 2015/1814 of the European Parliament and of the Council of 6 October 2015 concerning the establishment and operation of a market stability reserve for the Union greenhouse gas emission trading scheme and amending Directive 2003/87/EC, OJ L 264, 9.10.2015, p. 1. The aviation activities within the initial scope of the EU ETS included all flights from or to an aerodrome situated in the territory of a Member State to which the Treaty applies, with some exceptions as listed in Annex I of the EU ETS Directive. However, in the light of the negotiations within ICAO looking to propose a global market based mechanism for reduction of aviation emissions, this scope has been temporarily reduced. Currently (until the end of 2016) only flights within the EEA are covered. Article 21 reports for the year (N) are required to be submitted by 30 June of the following year (N+1). The reports are submitted via Eionet which is a partnership network for data and information flows of the European Environment Agency (EEA) and its member and cooperating countries. For the reference to Article 21 reports, 'Member States' include the 28 EU Member States plus EEA countries (Iceland, Norway and Liechtenstein). See Commission Regulation (EU) No 601/2012, where category C installations emit more than 500 000 tonnes CO2e per year, category B installations emit between 500000 and 50000 tonnes CO2e per year, and category A installations emit less than 50000 tonnes CO2e per year. Furthermore, 'installations with low emissions' are those category A installations which emit less than 25000 tonnes CO2e per year. Decision No 406/2009/EC of the European Parliament and of the Council of 23 April 2009 on the effort of Member States to reduce their greenhouse gas emissions to meet the Community’s greenhouse gas emission reduction commitments up to 2020, OJ L 140, 5.6.2009, p. 136. Commission Decision 2010/2/EU of 24 December 2009 determining, pursuant to Directive 2003/87/EC of the European Parliament and of the Council, a list of sectors and subsectors which are deemed to be exposed to a significant risk of carbon leakage, OJ L 1, 5.1.2010, p. 10. Commission Decision 2014/746/EU of 27 October 2014 determining, pursuant to Directive 2003/87/EC of the European Parliament and of the Council, a list of sectors and subsectors which are deemed to be exposed to a significant risk of carbon leakage, for the period 2015 to 2019, OJ L 308, 29.10.2014, p. 114. The figures include notifications received until July 2015 and may be subject to large changes due to later notifications by Member States. Initial amount, before application of the reductions mentioned below in the table. European Energy Exchange AG (EEX) and Intercontinental Commodity Exchange (ICE) were listed in Annex III of the Auctioning Regulation as the opt-out auction platform for Germany and the United Kingdom respectively. Poland has not yet appointed its own opt-out auction platform and in the absence of listing is making use of the transitional common auction platform. Early auctions of allowances of phase 3 were performed in 2012 in view of the widespread commercial practice in the electricity sector of selling power on a forward basis and purchasing the required inputs (including allowances) when they sell their output. Decision No 377/2013/EU of the European Parliament and of the Council of 24 April 2013 derogating temporarily from Directive 2003/87/EC establishing a scheme for greenhouse gas emission allowance trading within the Community, OJ L 113, 25.4.2013, p.1. For 2015 the figure refers to number of allowances to be auctioned pursuant to the published auction calendars. Bulgaria, Cyprus, Czech Republic, Estonia, Hungary, Latvia, Lithuania, Malta, Poland and Romania are eligible for the derogation. Malta and Latvia decided not to make use of it. Both CDM and JI projects generate Kyoto carbon credits: Certified Emission Reductions (CERs) and Emission Reduction Units (ERUs) respectively, each equivalent to 1 tonne of CO2. Commission Regulation (EU) No 550/2011 of 7 June 2011 on determining, pursuant to Directive 2003/87/EC of the European Parliament and of the Council, certain restrictions applicable to the use of international credits from projects involving industrial gases, OJ L 149, 8.6.2011, p. 1. Track I Joint Implementation refers to the procedure whereby a host party may issue JI credits following verification, without reference to the Joint Implementation Supervisory Committee (JISC). Track 2 Joint Implementation refers to the procedure where verification is done under procedures laid out under the Joint Implementation Supervisory Committee (JISC) . Under Track 2 an independent entity accredited by the JISC has to determine whether the relevant requirements have been met before the host Party can issue and transfer credits. Unallocated allowances are allowances not allocated pursuant to Article 10a(7) of the EU ETS Directive, i.e. allowances remaining in the new entrants' reserve, and resulting from the application of Article 10a(19) and (20), i.e. allowances foreseen for free allocation to installations but remaining unallocated because of (partial) cessation of operations or significant capacity reductions. This also includes cancelled allowances. NIMs are the National Implementation Measures pursuant to Commission Decision 2011/278/EU containing the preliminary calculation of the number of free allowances to be allocated to each installation in the territory of all Member States and EEA-EFTA states which have been notified to the Commission. Directive 2008/101/EC of the European Parliament and of the Council of 19 November 2008 amending Directive 2003/87/EC so as to include aviation activities in the scheme for greenhouse gas emission allowance trading within the Community, OJ L 8, 13.1.2009, p. 3. Regulation (EU) No 421/2014 of the European Parliament and of the Council of 16 April 2014 amending Directive 2003/87/EC establishing a scheme for greenhouse gas emission allowance trading within the Community, in view of the implementation by 2020 of an international agreement applying a single global market-based measure to international aviation emissions, OJ L 129, 30.4.2014, p. 1. Data as of September 2015. Directive 2004/39/EC of the European Parliament and of the Council of 21 April 2004 on markets in financial instruments amending Council Directives 85/611/EEC and 93/6/EEC and Directive 2000/12/EC of the European Parliament and of the Council and repealing Council Directive 93/22/EEC, OJ L 145, 30.4.2004, p. 1. Oversight in the primary market will continue to be covered by the Auctioning Regulation, other than issues related to market abuse, where the Market Abuse Regulation will be directly applicable. Due diligence checks are already mandatory in the primary market and in the secondary market in emission allowances' derivatives. Emission allowances are subject to VAT as they are a taxable supply of services. The reverse charge moves the responsibility for the payment of the VAT transaction from the seller to the buyer of a good or service and constitutes an effective safeguard against VAT fraud. Although called 'calculation based', the method requires several measurements. In particular the quantity of fuels and materials leading to emissions needs to be measured. The emissions are then calculated as 'quantity times emission factor (times other factors if applicable)'. Chemical analyses are required for determining the emission factors in case of high emissions and/or more heterogeneous fuels and materials. In other cases default factors may be used. 'Measurement based methodologies' refer to the use of Continuous Emissions Measurement Systems (CEMS). Article 26 of Commission Regulation (EU) No 601/2012. Other parameters are the emission factor, for which usually a default value is applicable, and the fuel density, which again can often be based on a default value. Only one Member State has reported to have such system in place for certification, and only one verifier has been certified under that system. Scopes are defined by Annex I of the AVR, which creates a link to the activities listed in Annex I of the EU ETS Directive. Possible administrative measures are suspension or withdrawal of the accreditation, or a reduction of the scope of accreditation. This is the case when the operator does not submit a verified emissions report, or if the competent authority detects serious misstatements or non-conformities in the report. Directive 2009/31/EC of the European Parliament and of the Council on the geological storage of carbon dioxide (the Carbon Capture and Storage (CCS) Directive) was adopted as part of the 2009 climate and energy package. It provides a legal framework for the environmentally safe geological storage of carbon dioxide (CO2). It aims to ensure that there is no significant risk of leakage of CO2 or damage to public health or the environment, and to prevent any adverse effects on the security of the transport network or storage sites, thereby addressing public concerns. The Directive also contains provisions on the capture and transport components of CCS, though these activities are covered mainly by existing EU environmental legislation, such as the Environmental Impact Assessment Directive 1 and the Industrial Emissions Directive 2 . The European Commission considers the transposition measures to be complete for all Member States, except for one Member State with which discussions are ongoing. The Commission is advancing with the conformity checks of these measures. Article 38 of the CCS Directive requires the Commission to assess the CCS Directive in a report to be transmitted by 31 March 2015 to the European Parliament and to the Council and to present a proposal for revision of the Directive if appropriate. This report, in addition, evaluates the Directive for its effectiveness, efficiency, coherence, relevance and EU added value under the Commission's Regulatory Fitness and Performance (REFIT) programme 3 . It also examines the extent of CCS deployment and outlines further steps to be taken regarding the wider economic and policy environment to accelerate deployment. An online survey and consultation of stakeholders and experts were organised to support the findings of this report. More than 100 responses were received to the survey from industry and utilities, research organisations and non-governmental organisations. These were complemented by targeted interviews, literature review and case studies. The Commission further consulted the Member States through the Information Exchange Group formed under Article 27(2) of the Directive. The survey and analysis were based on the review topics listed in Article 38 and the REFIT criteria. Further details are given in the evaluation report 4 . A constrain of the review is the fact that the number of CCS installations (referring to capture, transport and storage) achieved to date has been much less than expected when the Directive was passed. Only one project - the ROAD project in the Netherlands 5 - has practical experience with the Directive, other than with exploration permits and the feasibility of retrofitting large combustion plants with CCS. To comprehensively test the content of the Directive and perform a more in-depth assessment of its effectiveness and efficiency, a larger experience with application of the Directive and with CCS in general would have been necessary. In June 2008 the European Council, asked the Commission to propose as soon as possible an incentive mechanism for Member States and the private sector to ensure the construction and operation of up to 12 CCS demonstration plants by 2015 to contribute to mitigation of climate change. This target has not been reached and there are only two large scale CCS plants operating in Europe (both in Norway). So far, one CCS project – the White Rose project in the United Kingdom – has been awarded EUR 300 million under the second call of the NER 300 programme 9 . In addition, the UK has awarded study contracts to the White Rose and Peterhead projects 10 . The European Energy Programme for Recovery (EEPR) 11 earmarked EUR 1 billion for CCS demonstration projects. Currently, two projects – the ROAD project in the Netherlands and Don Valley in the United Kingdom are ongoing. In total, there are four projects at the planning stage in the EU, which could start operation around 2020. Once operational, these projects would complement the experience of two Norwegian commercial projects, linked to natural gas production – Sleipner and Snøhvit. However, this rate of progress with large-scale CCS in Europe is much slower than expected. Carbon capture and utilisation (CCU) is a relatively new development which offers the potential to reuse CO2 as a feedstock for several applications. CCU is expected to have much smaller scale impact on climate mitigation than CCS, but it has a number of potential benefits, including adding economic value to CCS projects. The CCS Directive provides the legislative framework for addressing environmental, health and safety concerns about the storage of CO2. It harmonises administrative procedures for the whole cycle of carbon capture, transport and storage across Member States and so creates the necessary legal certainty for investors to construct large-scale installations for CO2 capture and transport pipelines and to develop CO2 storage sites. This section looks at the specific questions the Commission was asked to answer for the REFIT process and Article 38 of the Directive. The number of CCS installations constructed is much lower than expected due to the lack of a commercial case for the technology, largely because of the global economic downturn and low carbon prices. The lack of practical experience with the technology makes it difficult to assess progress towards objectives such as creating legal certainty, ensuring the installations are safe for the environment and human health and determining efficiency through evaluation of administrative costs or regulatory burden. The lack of practical experience of CCS projects going through the regulatory process described by the CCS Directive also makes it impossible to identify data on the costs of implementation that have fallen on the Member States and therefore to assess the Directive's efficiency. The Directive focuses on the key issues required for a common approach in the development of CCS. The need for action to reduce emissions remains high and the most recent analysis 13 suggests that this need has become even more urgent. The provisions of the CCS Directive are internally coherent and the Directive is aligned with the overall climate and energy framework. The Directive provides the overall framework, while Member States specify, decide and apply the site-specific details of CCS installations. The evidence so far is that this approach has provided sufficient minimum requirements and guidance to ensure a common approach while leaving Member States sufficient freedom to adapt them to their national circumstances. Due to the EU's limited experience with CCS, permanent containment has not yet been fully demonstrated at a large scale. Results from research-scale storage sites and from projects in other countries, in particular from the two large-scale Norwegian projects that have been injecting CO2 into saline aquifers under the North Sea (since 1996) indicate that safe and long-term storage without leakage is possible. So far, only one permit has been awarded under the Directive - to the ROAD project, by the Competent Authority in the Netherlands. The Commission gave a positive opinion on the draft permit 14 . Referring draft permits to the Commission for review under Article 10 does not significantly prolong the time needed to obtain a permit. Articles 19 and 20 on financial security and the financial mechanism give Member States enough scope to decide how site operators should prove their ability to safely operate and monitor a storage site up to the point of transfer of responsibility to the Competent Authority. There is no practical experience with Article 18 on transfer of responsibility. The application of this Article will be examined in the next review of the Directive. There is no practical experience yet with these requirements, so the Commission considers that no action is necessary at this stage. These articles will be examined in the next review of the Directive. There are currently no plans to store CO2 in third countries due to the cost of transport and the availability of storage within the EU. The criteria for the characterisation and assessment of storage sites set out in Annex I to the Directive are used to determine the suitability of geological formations for use as storage sites. They are generally viewed by stakeholders as acceptable. Some stakeholders have reported difficulties in getting geological data from areas explored or used by oil and gas companies. The Commission considers that there is no need for action regarding the Directive. However, it would help new entrants if Member States examined their regulatory processes with a view to promote relinquishment of closed hydrocarbon fields. Annex II to the Directive sets out the criteria for establishing and updating the monitoring plans for operation and post-closure. These criteria are generally accepted as workable. The Commission is of the view that it is too early, given the lack of practical experience, to amend the existing technical requirements. The challenges associated with deploying CO2 capture for biomass plants are not significantly different from those associated with CCS for coal power plants. There are currently no specific incentives in Europe to apply CCS to installations combusting biomass. The Commission considers that there is no need at this stage for further regulation of CO2 transport. The risks entailed in transport of CO2 are no higher than those of the transport of natural gas or oil and there have been no events or suggestions to warrant any change in current regulations. In 2011, the Commission investigated the potential impact of emissions performance standards (EPS) for newly built power plants and the interaction with the ETS 17 . The study concluded that even under conservative assumptions about the development of the EU ETS, the implementation of EPS from 2020 would not provide additional incentives for CCS deployment. With the 2030 climate and energy policy framework, including the target of reducing greenhouse gas emissions by at least 40% by 2030 compared to 1990 levels, supported by the October 2014 European Council, the Commission does not consider it necessary or practicable to establish a mandatory requirement for EPS for new power plants. The ongoing reform of the EU ETS, with the proposed introduction of a market stability reserve and the increased ambition of the EU ETS beyond 2020 with the target of reducing emissions by 43% by 2030 compared to 2005, is expected to substantially boost the investment climate for low-carbon technologies over time. Based on the evaluation study, the Commission finds that the CCS Directive is fit for purpose. Overall, and despite the limited information available so far on its practical application, stakeholders are of the opinion that the Directive provides the regulatory framework needed to ensure safe CO2 capture, transport and storage while allowing the Member States sufficient flexibility. However, the lack of practical experience of projects going through the regulatory process precludes a robust judgement of the performance of the Directive. There is clear stakeholder concern that reopening the Directive now could be counterproductive as it would bring a period of uncertainty for CCS, which would not be helpful in a sector where investor confidence is already low. As regards the REFIT evaluation, the Commission concludes that there is insufficient evidence at this stage to judge the full effectiveness of the Directive, to carry out an efficiency analysis of administrative and regulatory burden and to look at aspects of simplification. Stakeholders and Member States consider the Directive necessary for the safety of geological storage and to provide legal certainty for investors. The Directive is coherent within its own provisions and with other related legislation. As regards EU added value, the Directive is generally considered to provide a good balance between defining an outline approach at EU level and the Member States developing their own detailed and case-specific interpretation. The next review of the CCS Directive will be carried out when more experience is available with CCS in the EU. It is important to maintain support for commercial-scale demonstration projects both in the power and industry sectors, as this is essential to gain experience, bring down costs and demonstrate safe and reliable underground storage of CO2. At EU level, the Innovation Fund, which should be endowed with 450 million allowances under the EU ETS, should support CCS besides innovative renewable energy and energy-intensive industry. 18 It is essential for successful demonstration projects that Member States match the EU's financial support, as well as involving the private sector. Power generation and other industrial projects have long investment cycles, so it is important that Member States consider CCS as part of their long-term planning (ideally up to 2050) to be developed under the future Governance for the Energy Union. With a view to future CCS deployment, it is important to plan adequate CO2 transport and storage infrastructure, and consider sharing infrastructure to reduce costs. Advancing knowledge of CO2 storage capacity and mapping the location of key storage sites and clusters of CO2 sources would help with the planning of the future transport and storage network. The Connecting Europe Facility can play a role in supporting cross-border transport networks and regional cooperation in this area. Stepping up research and innovation activities in this area is one of the ten actions identified in the new Strategic Energy Technology Plan to accelerate energy system transformation and create jobs and growth 19 . Support will also continue through the EU Framework Programme for Research and Innovation Horizon 2020 20 . 'Study to support the review of Directive 2009/31/EC on the geological storage of carbon dioxide (CCS Directive)', Luxembourg: Publications Office of the European Union, 2015. For example, in the Commission's Communications The Future of Carbon Capture and Storage in Europe, COM(2013)180 and A Roadmap for moving to a competitive low carbon economy in 2050, COM(2011)112. A policy framework for climate and energy in the period from 2020 to 2030, COM(2014)15. The NER 300 programme is one of the world's largest funding programmes for innovative low-carbon demonstration projects and has awarded a total of EUR 2.1 billion to 38 renewable energy projects and one CCS project. It is established under Article 10(a)8 of Directive 2003/87/EC and funded by the sale of 300 million emission allowances from the New Entrants' Reserve (NER) set up for the third phase of the EU emissions trading system. See http://ec.europa.eu/clima/policies/lowcarbon/ner300/. For more on the UK CCS commercialisation competition, see https://www.gov.uk/uk-carbon-capture-and-storage-government-funding-and-support. Regulation (EU) No 1233/2010 establishing a programme to aid economic recovery by granting Community financial assistance to projects in the field of energy. GCCSI, 2014, The Global Status of CCS. IPCC AR 5 October 2014. http://www.ipcc.ch/. Commission Opinion relating to the draft permit for the permanent storage of carbon dioxide in block section P18-4 of block section P18a of the Dutch continental shelf, in accordance with Article 10(1) of Directive 2009/31/EC of 23 April 2009 on the geological storage of carbon dioxide, C(2012)1236. The United Kingdom has also produced a guidance note which explains what plant developers should consider and demonstrate in their feasibility checks to retrofit for CO2 capture: Carbon Capture Readiness (CCR) - A guidance note for Section 36 Electricity Act 1989 consent applications, URN 09D/810, November 2009, https://www.gov.uk/government/uploads/system/uploads/attachment_data/file/43609/Carbon_capture_readiness_-_guidance.pdf . Report on the Implementation of Directive 2009/31/EC on the geological storage of carbon dioxide, COM(2014)99. Bloomberg New Energy Finance, 2011, Emission performance standards: Impacts of power plant CO2 emission performance standards in the context of the European carbon market, http://ec.europa.eu/clima/policies/lowcarbon/ccs/docs/impacts_en.pdf. Proposal amending Directive 2003/87/EC to enhance cost-effective emission reductions and low-carbon investments, COM(2015)337. Commission communication Towards an Integrated Strategic Energy Technology (SET) Plan: Accelerating the European Energy System Transformation, C(2015)6317 final.